Your personal nutrition plan, delivered by email. Chronic Lyme Nutrition is proven to help Lyme patients recover more quickly, by strengthening their body and creating an environment where Lyme cannot survive. Your Chronic Lyme Nutrition subscription provides you with nutrition guidelines delivered by email. Your personal nutritionist, Robin Shirley, sends you with weekly guidance on what to eat. Each week you'll get a meal plan with breakfasts, lunches, dinners, desserts and snacks, easy and quick recipes, and done-for-you shopping lists. You'll also be invited to join the private facebook group for daily support from Robin as you need it. What Is Chronic Lyme Nutrition? Get your life back through nourishing, strategic nutrition. Each week, Robin will send you meal suggestions for breakfast, lunch, dinner, snack and dessert, along with 5 recipes that are quick and easy to prepare. You will get a weekly shopping list to compliment the meal suggestions and recipes. You don't even have to think! Just make one easy grocery trip each week. Once you subscribe, you can join our private Facebook group where you'll be able to ask questions, learn from others and stay on track with reminders from Robin and group support. All of the food recommendations and recipes are free from the five common allergens that affect Lyme patients most: corn, dairy, soy, gluten and eggs. 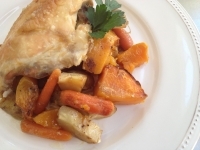 The recipes are very close to Paleo and AIP and can be adapted easily. Prefer to eat out? No problem - Robin makes restaurant menu suggestions as well! You'll get Robin's guidebook to tell you exactly which foods you should include, which foods you need to avoid, with lots of case studies and explanations as to how nutrition can affect your Chronic Lyme treatment results! I'm Robin Shirley, Certified Health Coach and nutritionist to Chronic Lyme patients. I was infected in the summer of 2000, at summer camp in the Shenandoah Valley of Virginia. After 12 painful years of symptoms, my diagnosis of Juvenile Rheumatoid Arthritis was finally attributed to Chronic Lyme Disease. I was able to begin appropriate treatment. After overcoming Chronic Lyme through a natural medical approach including nutrition therapy, I now consult with Chronic Lyme patients to support them with their own recovery. Please read more about me by clicking here. Want My Recipe For Energy? Try three of my favorite smoothie recipes for energy! I drink these superfood smoothie to hydrate, replenish nutrients and build my immune system's resilience. "What distinguishes Robin and her approach is her extensive knowledge about nutrition and food, in general." "Last year I ran across Robin Shirley. I knew Robin was a special person but didn't realize how special until I hired her and worked with her in early 2015. The difference with Robin is that she's not just a health coach or nutritionist, she has lived and conquered the disease, so she can 110% relate when you talk about symptoms or issues. Not only is Robin easy to talk to and knowledgable, she is someone you can trust. Trust is huge in the battle to get well and live a normal life. Robin listens and focuses on what you need to do to get healthy. Not like others who may want to keep you ill to make money off you, she cares and shows it as she is responsive, flexible, effective and supportive. I have only been working with Robin for a few months but saw an immediate impact in my road to recovery and ability to focus on what's important. We talk weekly and will keep doing so for a few more months, then I will keep in touch with her monthly to keep me on track and reaching my goal of 100% recovery. I wouldn't hesitate to recommend Robin to anyone who is experiencing any Lyme related disease symptoms as she is the best resource I have found and I have been looking for almost 6 years. I feel blessed and thankful that Robin is in my life working with me to make it better. " Robin is a great influence on so many people and is sharing her passion and gifts with people around the world. Thank you Robin for your heart and all that you continue to do in transforming people’s lives. You are a blessing to so many. With debilitating symptoms, little scientific explanation and no cure, Lyme disease is almost impossible to manage, let alone recover from. Chronic Lyme patients have unique nutritional needs that are being ignored by many professionals. When you give your body what it needs, and eliminate what it doesn't need, your immune system is better able to manage the Chronic Lyme and the treatments. A lot of people underestimate the power of nutrition in supporting your immunity, your energy and your hormones. In my private practice with Lyme Patients, I have found that eliminating certain food allergens and replenishing missing nutrients can bring a huge improvement in symptoms, including a better memory, clearer thinking, inflammation-free joints, more energy, a positive mindset and better sleep. This allows you to see what symptoms are truly attributed the the Chronic Lyme, and it allows your body to fight that infection more effectively. Your first week of meal plans and recipes will be delivered within 24 hours after your payment goes through - usually as soon as 30 minutes. Everything will be delivered to you by email, on a weekly basis. You're definitely not alone! Over the years, most of my clients have been budget-conscious. As a result, I've kept this in mind when developing recipes and shopping lists. I'll also make sure to include budget-saving tips in the weekly emails. Once I subscribe, when and how will I get the first meal plan and recipes? I don't want to spend a fortune on groceries, will I go broke on these meal plans? There are so many unique food allergies that it is almost impossible to accommodate everyone. I've kept all gluten, dairy, soy and refined sugar out of the recipes and recommendations. If you have an allergy to a specific fruit, spice, vegetable or other food, you probably have a knack for substituting it with a similar food! You can also feel free to ask for replacement ideas on the private Facebook group. I'm on the Paleo/AIP Diet - do I need your meal plans too? These recipes and meal plans are very easily adaptable to those protocols. Chronic Lyme Nutrition is more specific towards Lyme Disease, which is a unique illness that cannot be lumped into the Autoimmune pile. get your first meal plan immediately! get started with your Chronic Lyme Nutrition plan.